Following the recent success of their MST3K Reunion Show, Michael J. Nelson, Kevin Murphy and Bill Corbett take on the spooky 1962 cult classic Carnival of Souls with their unique commentary. 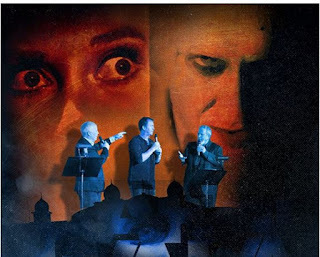 “RiffTrax Live: Carnival of Souls,” will be broadcast live to select movie theaters across the country on Thursday, October 27 at 8:00 p.m. ET / 7:00 p.m. CT and tape delayed to 7:00 p.m. MT / 8:00 p.m. PT, with an All Hallows’ Eve encore on Monday, October 31 at 7:30 p.m. local time. This event will be the first big screen presentation of the recent full-color restoration of Carnival of Souls, a process that took over 50,000 man-hours to convert the original from black and white. Prior to this event, “RiffTrax Live: Mothra” will be broadcast live on Thursday, August 18, with an encore showing on Tuesday, August 23. Tickets for “RiffTrax Live: Carnival of Souls” can be purchased online by visiting www.FathomEvents.com or at participating theater box offices. Fans throughout the U.S. will be able to enjoy the event in more than 600 select movie theaters through Fathom’s Digital Broadcast Network. For a complete list of theater locations visit the Fathom Events website (theaters and participants are subject to change). "When we realized that the creators of the safety short Shake Hands with Danger had done a spooky feature film we knew we had to have it. How can you pass up the story of a church organist who moves to Utah - on purpose, mind you - only to get fired from her church organist position? It's bone chilling. And a perfect RiffTrax for Halloween!" Michael J. Nelson of RiffTrax said. When young Mary survives a horrible car crash in Kansas, she tries to start her life over with a new job in a small Utah town. Along the way, she’s haunted by a gaunt pale figure in a nice suit who leads her to an abandoned carnival pavilion on the shores of the Great Salt Lake. Soon, Mary doesn’t know if she’s awake or dreaming, alive or dead. Weird, creepy and very silly, Carnival of Souls, as riffed by the Rifftrax crew, is the perfect Halloween treat.